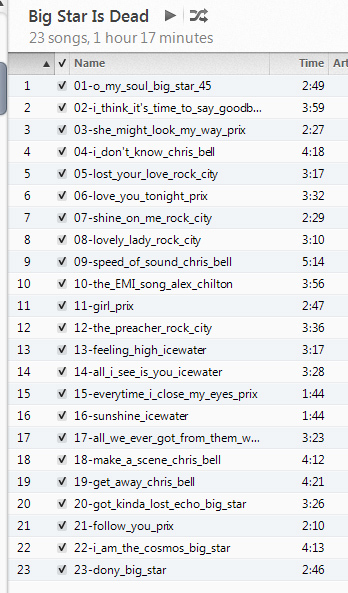 I have plans for a country rock mix, which I'll have ready for next week. A couple nights ago I got an email from Sal, wondering if I'd heard The Scruffs, another Ardent band everyone thought was going places, but didn't and fell apart. I was surpised there was more from that Memphis studio I still hadn't heard. 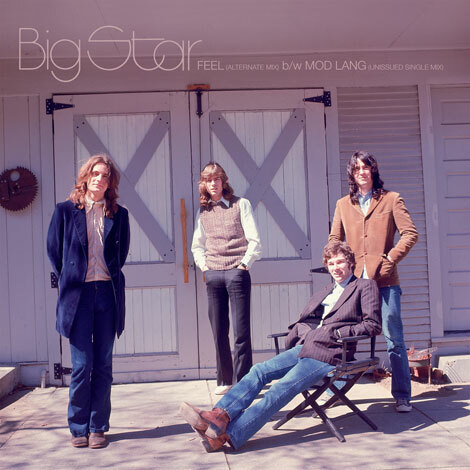 They were really good, and the record sounds like "Big Star 77". Power pop with a punky edge. One of the songs I recognized as a version fromTommy Hough, Memphis musician and songwriter who contributed vocals to "Big Star's Third". He was also in a short lived project with John Tiven, "producer" of Alex's "Bachs Bottom". They recorded as Prix, and claimed Alex Chilton as a member with Chris Bell's involvement in recordings that never saw the light of day. Until recently. Big Star Stuff compiles Prix with all the bonus odds n ends to make something like a Big Star experience. 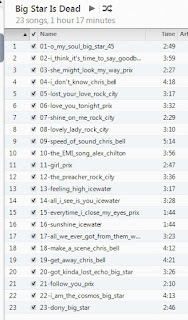 All songs involve Chris, Alex, Andy, and/or Jody. It starts off with the 45 version of "O My Soul", ripped from a single autographed by and purchased from Andy Hummel, and ends with "I Am The Cosmos", from "Columbia" 1993, and "Dony", from "In Space" (2005). The "stereo" mix of "Got Kinda Lost" was created by me from a bootleg purchased from Sal. This time, the link is mediafire, sorry about the inconvenience. Ignore threatening warnings from Chrome. Hey BBJ -- thanks this looks great. "magic_dust.zip is malicious and Chrome has blocked it." I can't even spell zip but wonder if you have any thoughts. Chrome has been doing that lately. It did it to me when I tested the download. Ignore it. And really, what better stuff is there? Love BS and The Scruffs, too. For a merge of Big Star, The Scruffs (singer's voice), a touch of Raspberries and a dash (in the beginning only) of Pink Floyd, check "She Might Look My Way" by the band Prix on the just released compilation Ork Records: New York, New York. 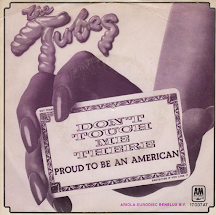 The Ork label also featured the early singles of Television, Alex Chilton, Chris Stamey and (gulp!) Lester bangs. Firefox delivered and I'm diggin' the mix as much (even more?) than I expected! I'm glad Firefox came through and that the Weekend Mix is alive. Next week I'll have a nice distillation of that country rock collection I keep mentioning. After that there is a holiday mix on the way. And I'm sure Sal will be back with another one before long. Good memories are stirred with the mention of the Scruffs. There first album is a classic and a later one called Pop Manifesto with a little more production is quite solid. I believe the name of the solo artist is Tommy Hoehn, very much a Big Star disciple. Also the Ardent Story has several Big Star related bands such as Cargoe and Hot Dog. Great mix, thanks much. Yes, Ken it's Tommy Hoehn, in my hurry to post, I neglected to look it up. And I would have also mentioned that Terry Manning is all over the place. Thanks for the thumb's up.